Amazing location in the country. Still in Allen County, but no strict subdivision or association restrictions. This nice 3 acre setting has a spacious and updated Cape code with 2 bedrooms on main level, also 2 up and a full bath on each level. It is on a crawl space and the Family room has a brick fireplace. New exterior, gutters, flooring, fixtures, paint and some windows. Also in 2018, updated furnace and new central air. Well cover also recently replaced. Roof is around 5 years old on the home. Detached garage has a large lean to attached for further storage. Upper area is for hobbies or more storage or entertainment. Also 2 horse stalls. There is an additional large barn that has a working well pump. Great location, wonderful renovations and improvements. 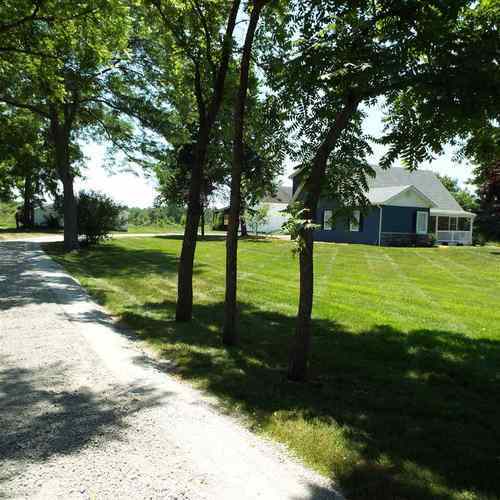 The property is very nice and you can enjoy the acreage and still be close to schools and shopping and highways. Laundry area is also on the main level. Enjoy that front porch and the semi circle stone driveway once you choose to make this your next place to live ! Seller providing a 1 year home warranty from Home Warranty Inc. Home currently has no exemptions- So if added with Buyer taxes should be greatly reduced. Upgraded to 200 am electrical service Aug 2018 .Well priced !